We are living in the midst of a technological revolution. Future historians are bound to record the last 2 decades of the twentieth century and the beginning of the twenty-first century as the second renaissance of the human race. Time is truly witness to an age in which humanity is taking its next leap in intellectual evolution. Just as the invention of the printing press revolutionized the dissemination of knowledge in the 15th century, so too has the internet altered the course of human history by shrinking the world around us. Smartphones have quite literally brought the world to our fingertips. No longer do we need to visit a store to shop, stand by the street corner to hail a cab, visit the post office to mail a friend and of course, stand stationary at one place tied to an immovable electronic communication device while talking to a friend! In this blog, we will discuss OCR technology, yet another modern invention destined to radically change our lives as well as the way business organizations operate in the near future. Simply put, OCR or Optical Character Recognition is a technology that replaces manual typing and helps in easy backend management. The Accurascan document scanning mobile app has been developed by Accura Technolabs. It is a Singapore based R&D company that focuses on computer vision technology for real time and accurate text recognition. The demo version of this app is available for free download both with the Google Play Store as well as the Apple App store. With the help of this app, you can do away with time-consuming manual tasks, eliminate human error and save a lot of time. The company also offer a ready to use scanning solution called AccuraGo which is SaaS based and works with Android, iOS, and web. Using AccuraGo, you can avail all the attributes of Accurascan as well as a host of additional benefits. You can scan a variety of documents and export them as editable Excel or PDFs. These files can then be either saved on the device or uploaded onto a cloud server. What is SDK or API? SDK (Software Development Kit) or API (Application Program Interface) is a set of tools that can be used to enhance the Accurascan app. With the help of this tool which works with iOS, Android, and web, the app can be customized to meet unique business needs. It can also be integrated with any third party application. How does SDK/API enhance user experience? With the help of SDK/API, we can enhance the attributes of the Accurascan app. 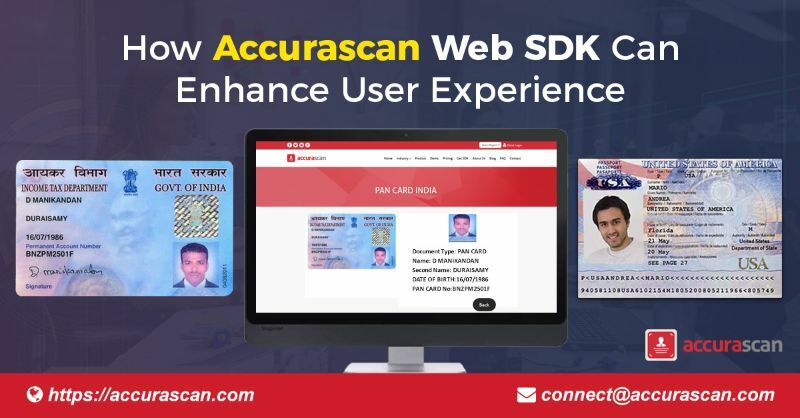 Alternatively, if a company already possesses an app or web interface of its own, using the SDK, it can directly integrate the Accurascan SDK into any third-party application. Again, since no significant additional development work is required, a substantial amount of time and money is saved in the process. Furthermore, the company also saves more time and money by not having to launch and promote a brand new product from scratch. OCR document scanners are slowly but surely changing the ways businesses operate. For instance, a passport is a powerful document that doubles both as a traveling document as well as an ID proof. A mobile passport reader that can scan passports would, therefore, be an invaluable tool at the disposal of multiple industries.